These are truly the best Oatmeal Cookie Sandwiches with Brown Sugar Peach Ice Cream ever! And the homemade brown sugar peach ice cream is hands down the best I’ve ever made. The trick to the extremely creamy, smooth texture is cream cheese… who would’ve thought? I’ve tried several homemade ice cream recipes, but this was my first using cream cheese and heavy whipping cream and what a difference it makes. The recipe uses brown sugar instead of granulated. The subtle peach flavor comes from sautéed peaches and a little peach liqueur. I baked oatmeal cookies using a simple recipe you can find here, but I skipped the raisins. To make it even easier, just buy the cookies if you prefer. 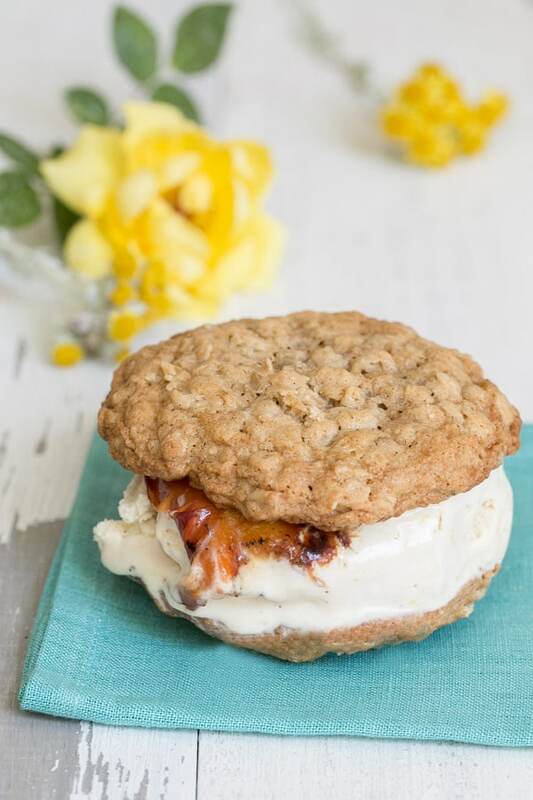 I promise you won’t be disappointed with these delicious oatmeal cookie sandwiches with brown sugar peach ice cream! They’re messy as can be, but worth it. 6 ounces cream cheese, room-temp and softened completely. 4 peaches, sliced and sauteed. Whip the cream cheese in a large bowl until smooth. Mix in the salt. In a small bowl, mix together the cornstarch and 1 tablespoon whole milk and mix until combined. In a larger bowl prepare an ice bath. Just fill it with ice and let it sit for a few minutes while you continue the recipe. In a heavy sauce pan, combine the whole milk, heavy cream, sugar and corn syrup. Bring to a boil on medium heat, then boil for 4 minutes, exactly. Remove from heat, add in the cornstarch and stir. When the mixture is hot, slowly pour it over the cream cheese, whisking as you go so there are no clumps in the cream cheese. Pour the ice cream into a large Ziplock bag and seal. Then submerge into the ice bath until cold. Save about 8 sauteed peach slices to put on the ice cream sandwiches. Lightly, puree the rest of them and set aside. Pour the mixture into your ice cream machine and freeze according to directions. When it’s almost done freezing, add in the peach liqueur and pureed peaches. Usually you can tell when the ice cream is done when it pulls away from the sides. Once it’s done, assemble your cookie sandwiches by adding two scoops of ice cream in between two cookies. 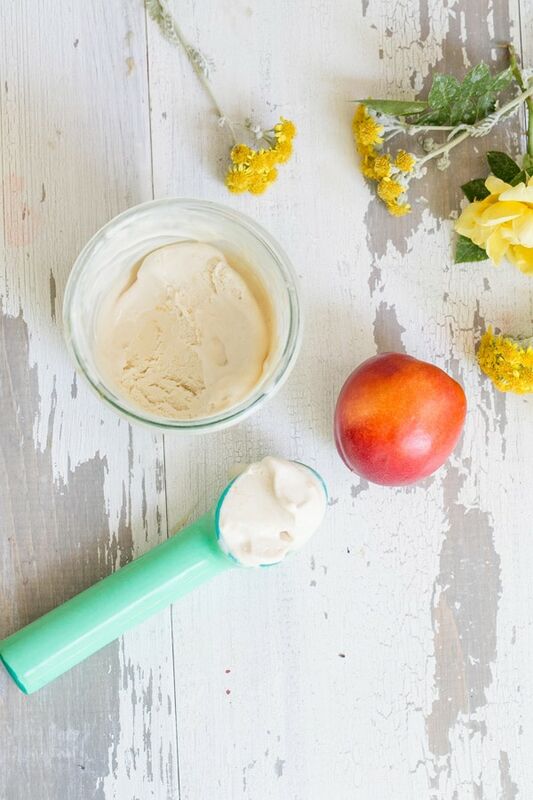 Place a few sauteed peaches on the ice cream too. Enjoy and stay peachy!